Correction: In the original version of this article the name Dumeresq de Pencer was misspelled. The Gazette has corrected this and regrets the error. Writer’s cramp is a condition characterized by cramps and quaking of the hands and fingers, typically caused by overworking them on delicate tasks, like typing. The cramp is sure to set in this month. November is National Novel Writing Month (NaNoWriMo), a challenge designed to stretch and test writers. The premise is simple: craft a 50,000 word novel by the end of November. “It averages out to about 1,700 words a day,” says Darrin Carr, a University of King’s College student and hesitant NaNoWriMo participant. NaNoWriMo.org is a charity-run online community for writers to communicate and encourage one another as they race towards their oasis: a completed draft. Writing workshops and meet-ups are scheduled by regional participants. But such devoted engagement is difficult for students. Sacrificing an entire month to novel writing is suicide of the social, and academic, life. 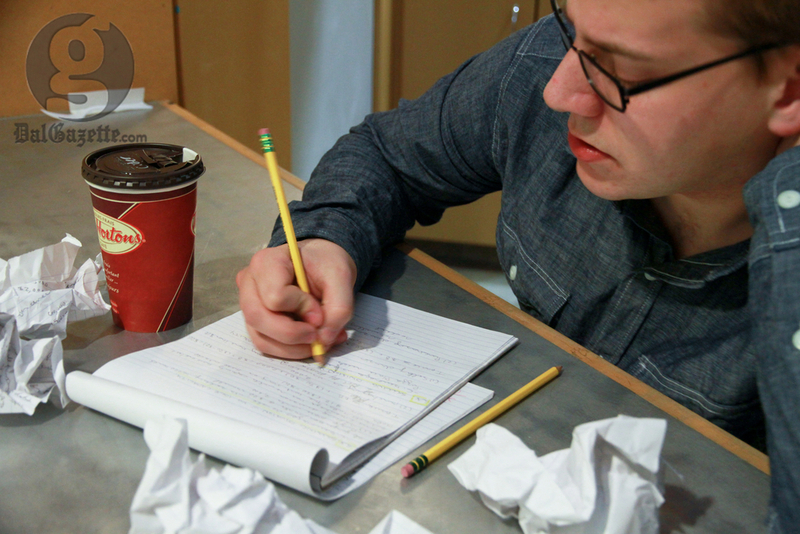 Many aspiring student writers are choosing to adopt the NaNoWriMo model of writing as a sort of quiet encouragement. Dumeresq de Pencer is a King’s student, and has been writing fiction for pleasure since he was young. For students working on a project through this month, what’s important, says Shoshana Deutsh, is getting anything down. Deutsh is head of the King’s Wordsmiths, and is a little chagrined at the prospect of thousands of independent works flooding the market. Qualms aside, the process of writing a full-fledged novel is a formidable pursuit. “It’s daunting as a whole right when you begin, even with a plan, but you keep going, and it comes to you,” muses Carr. Mat Wilush once went to see Agent Orange on the outskirts of Toronto, where the beer was salty and drunken teenagers took turns sitting in a prop electric chair. The music had aged poorly. A mohawk’d middle-ager danced through the first couple songs, but quickly tired out. There just isn’t much room for surf rock in the world anymore. What next? Mat Wilush wants to know. Mat is the Gazette's Arts Editor. Follow him on Twitter at @wilushwho and email him at arts@dalgazette.com.